CASE STUDY — Nearly 200,000 residents in Oregon’s Eugene-Springfield area share something besides geography. In recent years, The Freshwater Trust has been part of a collaborative effort with local conservation groups, alongside EWEB and the Metropolitan Wastewater Management Commission (MWMC), to implement a series of restoration actions to improve the quality of a river that links so many. In 2014, EWEB began piloting a program that would compensate landowners for protecting and restoring streamside forests along the McKenzie. These buffers of native trees and shrubs mitigate floods, prevent erosion, filter pollutants, and provide water-cooling shade and habitat for salmon and other regulated species in western states. The utility has since added naturescaping and septic system assistance to the actions that can be incentivized by the program. To pilot the program, EWEB identified 15 sites where restoration would benefit water quality. EWEB, The Freshwater Trust and local conservation partners, like the McKenzie Watershed Council and the Upper Willamette Soil and Water Conservation District, developed a protocol to support assessments of whether a particular site is high quality enough for a landowner to receive annual payments through the program. According to EWEB, approximately 13,000 acres of land owned by private individuals, local governments and nonprofit organizations could be eligible for the program. Upon a landowner expressing interest, a PWP representative visits the site and runs through an evaluation process to determine the level of ecological function provided by the existing native plants, instream habitats, floodplain conditions, and other features on site. 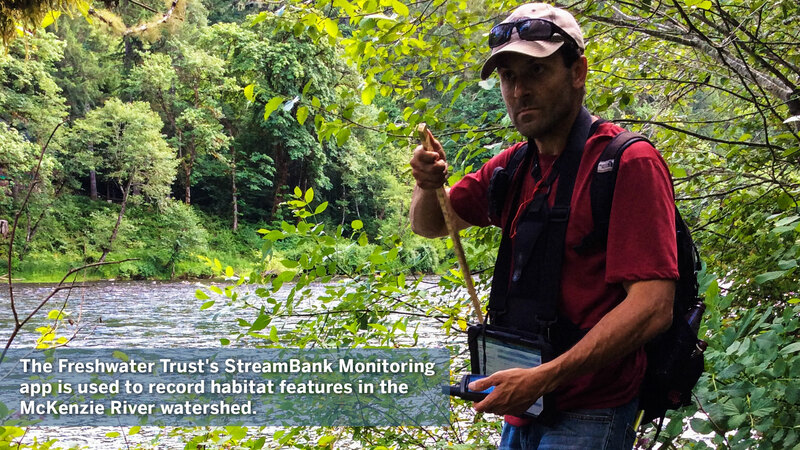 For this evaluation, The Freshwater Trust developed an iPad application, based on its StreamBank® Monitoring app, to support the quick collection and synthesis of data in the field. This determines if the landowner would be eligible to receive payments in return for protecting the existing healthy riparian area. For land that lacks a healthy forest, landowners can access funding sources through the PWP to restore degraded riparian areas, and may be eligible for incentives once quality standards are met. “The PWP is built on the concept of creating and sustaining protection and restoration activities at a meaningful scale and connecting upstream landowners with downstream water users,” said Morgenstern. “We are tweaking the program based on lessons learned in the pilot and are preparing for a full roll-out later this year. In the same region, other streamside restoration work is happening. The MWMC – a regional wastewater entity formed through a partnership between the cities of Eugene and Springfield and Lane County, Oregon – has undertaken a pilot program with The Freshwater Trust to demonstrate the cost-effectiveness of a water quality trading program. Under the Clean Water Act, the MWMC is required to offset the impact of the warm, but clean, water discharged into the river after being treated. For its Riparian Shade Sponsorship Pilot Project, the MWMC identified three sites on two side-channel systems of the McKenzie River and Willamette River as high priority for protecting fish habitat and water quality. One site is on public land on the Springfield Mill Race. The other two sites are on Cedar Creek, and were managed by the McKenzie Watershed Council. 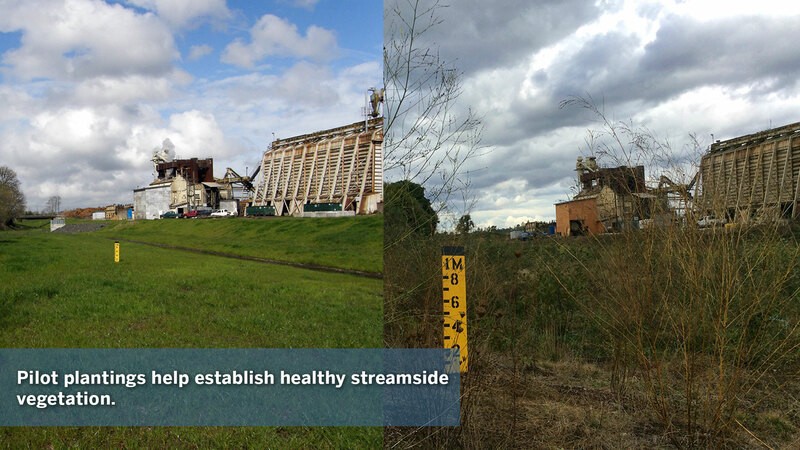 These sites were cleared of invasive plant species and planted with native streamside vegetation. These high priority sites were identified using The Freshwater Trust’s method of Quantified Conservation– one that utilizes data and technology to ensure that every restoration action taken translates into a positive outcome for the environment. Between the pilot sites, approximately 10,000 native trees and shrubs were planted, creating an environmental benefit of 15.5 million kilocalories of solar load blocked in the rivers. Those benefits were translated into credits, certified by a third party, and registered on a public website for the MWMC. The Freshwater Trust operates a nationally-recognized water quality trading program in Medford, Oregon. The natural solution being employed there to mitigate the thermal impacts of discharge on the Rogue River was $8 million dollars cheaper than the other solutions the city’s wastewater treatment plant considered to meet their compliance obligations. The Trust helped design a similar “natural infrastructure” program for the temperature issues present in the McKenzie River. Together, EWEB’s riparian incentives program and MWMC’s shade restoration program are building an integrated, watershed-wide program that has been gaining momentum for years with a diverse set of local partner organizations. “By building on what is already in place, or ‘connecting the dots’, we are able to develop new partnerships, attract outside investment, and more rapidly build and implement source protection projects,” said Morgenstern. The two groups signed a partnership agreement in 2014. EWEB is sharing data with the MWMC that will streamline outreach to landowners and minimize program costs because site identification and prioritization has already been completed, and interested landowners have already been identified. Going forward, The Freshwater Trust believes these combined efforts of conservation and restoration will create maximized outcomes for the McKenzie River. What are the benefits of forests and riparian shade on water quality? Old- and medium-growth forests provide a dense canopy cover and a layer of rich organic material on the ground that nourishes smaller plants such as ferns. The organic material acts as a natural filter for water that moves through the watershed, cleaning it as it flows to rivers and streams below. Forests also shade snowpack, controlling the rate at which it melts and flows year-round. Additionally, forests and riparian vegetation can reduce soil erosion; retain sediment, pollutants and excessive nutrients; add woody material necessary for cold-water fish spawning and resting habitats; and regulate water temperature to keep the aquatic ecosystem in balance. How is financing handled for these green infrastructure projects? The MWMC assesses its investment in the thermal load mitigation project based on the best overall value for the triple bottom line – community, economy and environment. To get the best return for its ratepayers, while also creating environmental benefit, the MWMC has used some streamlined financing options for its capital improvement projects, including an Oregon Clean Water State Revolving Fund loan with sponsorship option--a reduced interest rate loan for combined capital project with qualifying watershed project—along with bond funds. EWEB ratepayer funds and grants from the state provided funding for the Pure Water Partnership (PWP)* pilot project. A Watershed Conservation Fund is being built now to plug in diverse funding sources to a sustainable fiscal management system. Financing will come from sources such as EWEB protection funds, credit sales to MWMC, US Forest Service timber stewardship contracting, City of Eugene carbon offset investments, business sponsorships, and state grants. *The PWP was previously known as the Voluntary Incentives Program (VIP). What is the temperature issue being addressed by MWMC’s riparian shade program? To address future requirements in its National Pollutant Discharge Elimination System (NPDES) permit and potential temperature exceedances, the MWMC launched a pilot program to demonstrate the viability and cost-effectiveness of a water quality trading program for thermal load compliance. The MWMC discharges to the upper Willamette River just upstream of the confluence with the McKenzie River. The upper Willamette is part of the Willamette River Basin, potentially governed by a pending temperature Total Maximum Daily Load (TMDL) with criteria to protect salmon spawning and rearing habitat, and credits would be used to more than offset future temperature inputs resulting from this discharge. How were water quality trading credits generated from riparian sites? To secure regulator-approved temperature credits, the MWMC contracted with The Freshwater Trust to restore streamside vegetation at priority sites on the McKenzie and Willamette Rivers. One site was on public land on the Springfield Mill Race, and The Trust secured leases for two privately-owned sites on Cedar Creek. Sites were cleared of invasive plant species and replanted with roughly 10,000 native trees and shrubs. Willamette Partnership validated water quality trading credits and registered them for the MWMC in the Counting on the Environment database, following third-party verification of modeled credits and on-site conditions. The pilot successfully demonstrated the feasibility of a “green infrastructure” approach to reduce thermal loading and provide a compliance solution. The MWMC is preparing to generate additional credits by contracting for additional nonpoint source restoration sites. How was digital technology used for data collection for EWEB’s reference sites? Central to the PWP is assessing the quality of the riparian areas for interested landowners. The Freshwater Trust and partners developed protocols for assessing riparian forest quality using GIS desktop analysis and on-the-ground field surveys. Analysis using these protocols compares conditions on landowner sites to metrics collected from reference sites of healthy riparian areas. The resulting score for the quality of the landowner riparian area highlights recommended actions they can take to increase the health of these critical areas. The Freshwater Trust’s StreamBank Monitoring app was used for digitally collecting survey data and compiling it for analysis and reporting. StreamBank Monitoring is part of a patented toolkit for watershed restoration planning, monitoring and tracking. StreamBank allows municipalities, utilities and conservation partners to better understand the economic and environmental returns of restoration projects. Who are the partners involved in the EWEB PWP? Effective partnerships play an important role in EWEB’s source protection program. The PWP is designed to build on existing organizations and efforts, leverage and align existing funding sources, and develop programmatic approaches and infrastructure that allows actions on the ground to scale up and meet multiple goals. 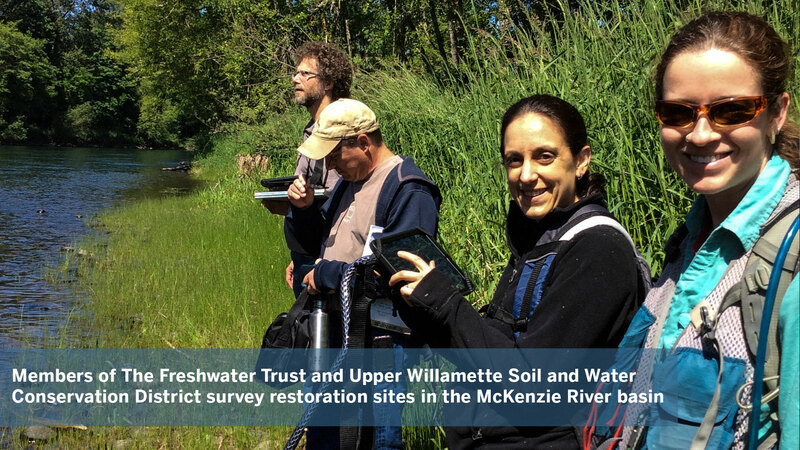 Examples of this include using existing expertise from the McKenzie Watershed Council and Upper Willamette SWCD to conduct riparian assessments, and develop and implement management plans. As a result, these organizations are now seeing more consistent funding, have many new landowner clients, and are working to support each other. Lane Council of Governments is managing GIS and other data that feed a watershed health dashboard, which plays to the Council's existing strengths as a regional GIS support organization. Cascade Pacific Resource Conservation and Development has the financial management capacity and expertise to handle fiscal management of these multiple funding sources. The Freshwater Trust is building on and adapting its StreamBank technology to allow efficient collection of riparian metrics and scoring that support protection or restoration decisions and selection of best fit for funding. How is the concept of "integrated water resources management" used in the McKenzie River programs? An integrated water resources management approach in the watershed promotes the coordinated development and management of water, land and related resources to maximize the resulting economic and environmental benefits. 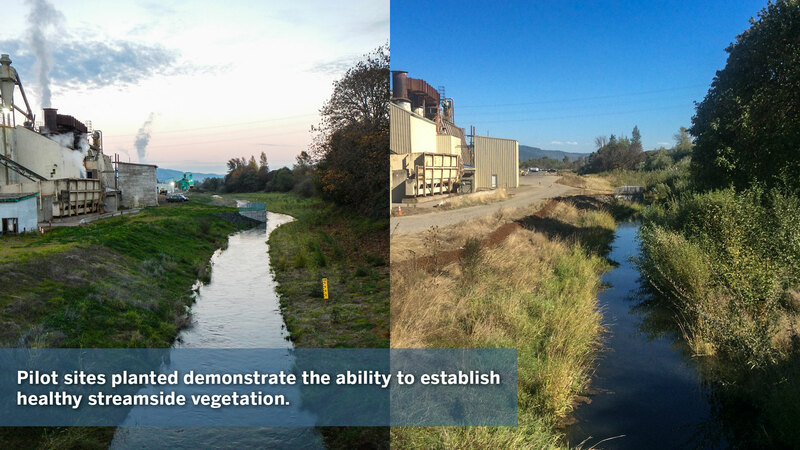 This approach can create solutions implemented at a large-enough scale that is meaningful for watershed protection. For EWEB, taking an integrated water resource management approach involved a wide range of partners and stakeholders in the design of the PWP that has helped to create a robust pilot program that is both scientifically sound and reflective of the needs and interests of all parties. Engaging landowners and customers in the process increases the level of buy-in as EWEB moves forward with the program. The results of this approach will provide greater watershed resiliency in the face of uncertainty around the impacts of a changing climate with more volatile weather patterns and declining snow pack. The MWMC's Todd Miller says, "Rather than our relationship to the environment being through a single pipe to the river, we are becoming more fully integrated into the environment and solving issues of drinking water, wastewater, stormwater, and aquatic habitat holistically under the 'one water' mindset."